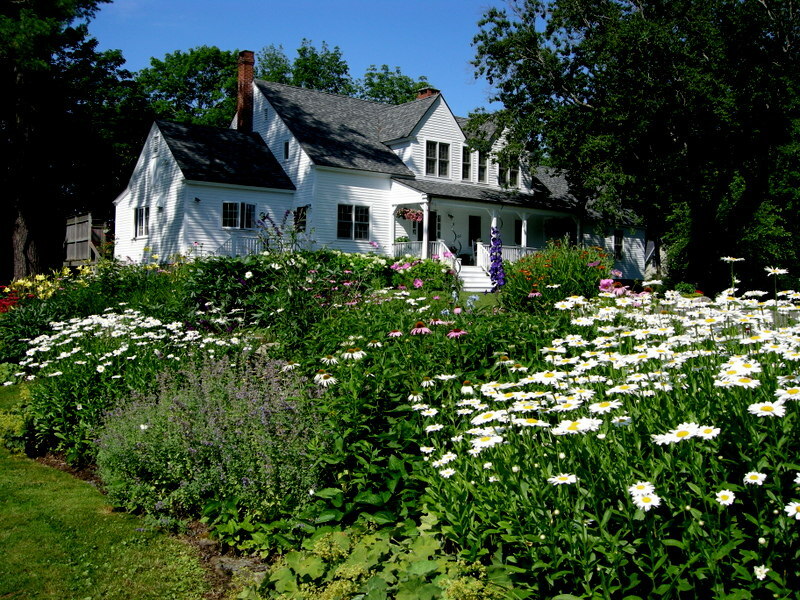 The Sortwell property in Camden contains everything that is beautiful about Maine gardens. The 66th Annual Camden House and Garden Tour, which I attended in July, gave me a chance to admire up close a few of the many gorgeous gardens along the Maine coast For photos of the Camden and Rockport, Maine, area and profiles of the first four gardens on the tour, read part 1 by clicking here. I intended to include the final two gardens in this post, but even when pared down there were too many photos for one installment. 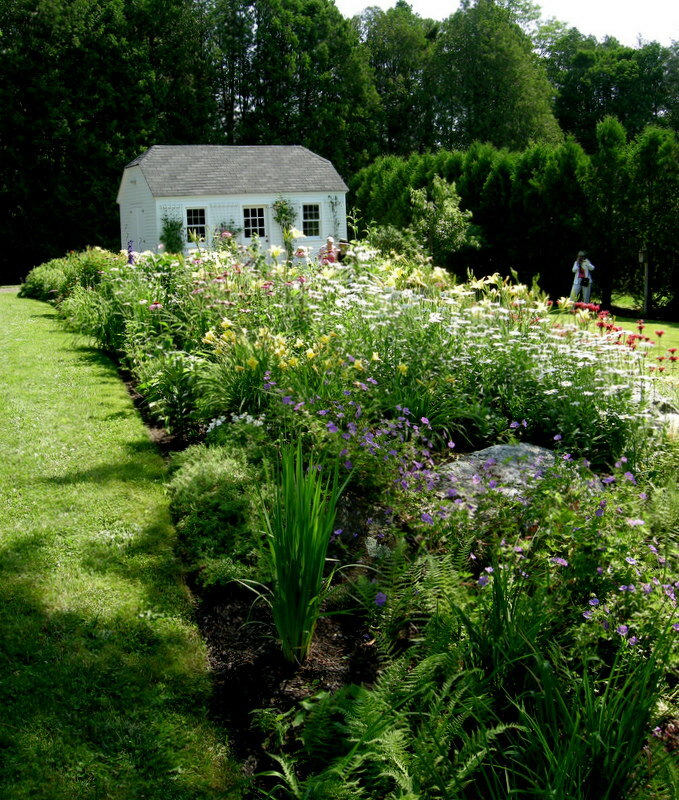 This post will focus on the classic Maine garden at the Sortwell residence. The elegant garden shed at the other end of the property from the house. The fifth garden on the tour was located within walking distance of downtown Camden. 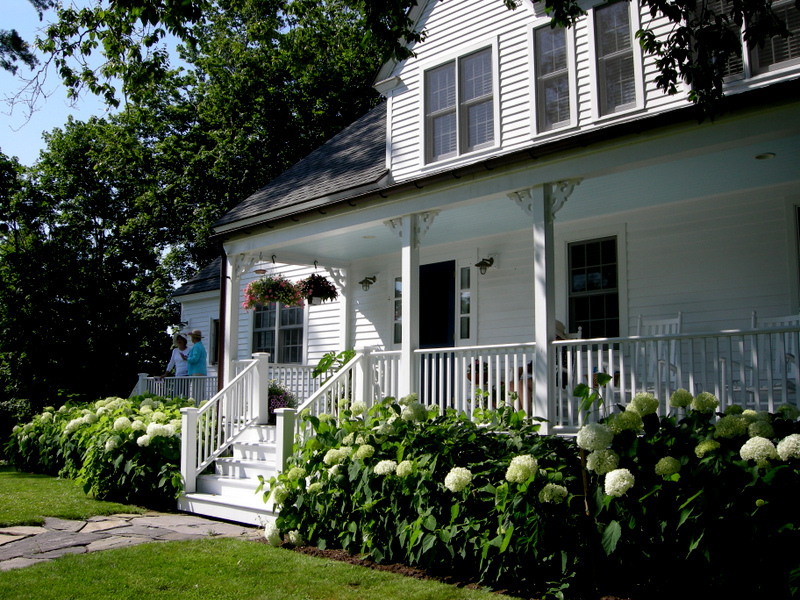 The house is an 1860s cape, a style prevalent in New England. The gardens surrounding the house suit the setting perfectly. 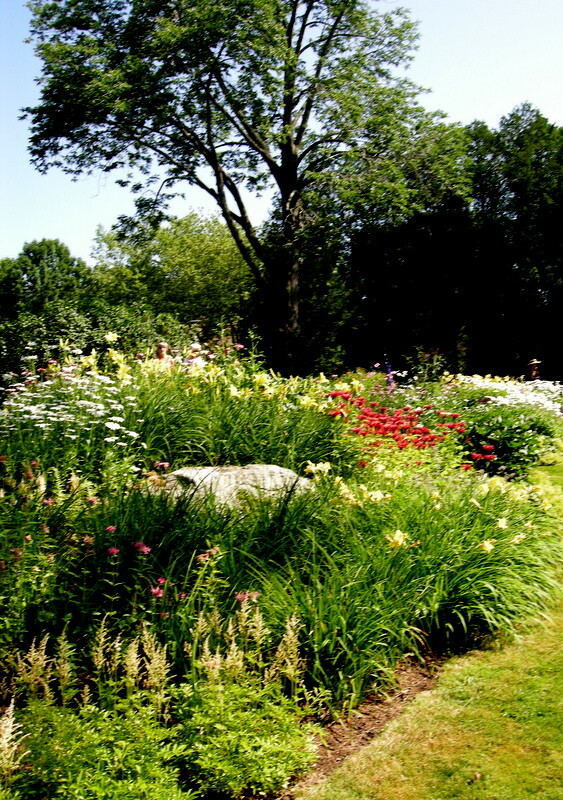 Large beds are filled with big stands of perennials and shrubs and partially covered by elegant shade trees. A picturesque garden shed nestled at the opposite end of the property from the house provides a perfect focus for perennial beds. The view from the house to the shed, as you can see the perennial border is huge. 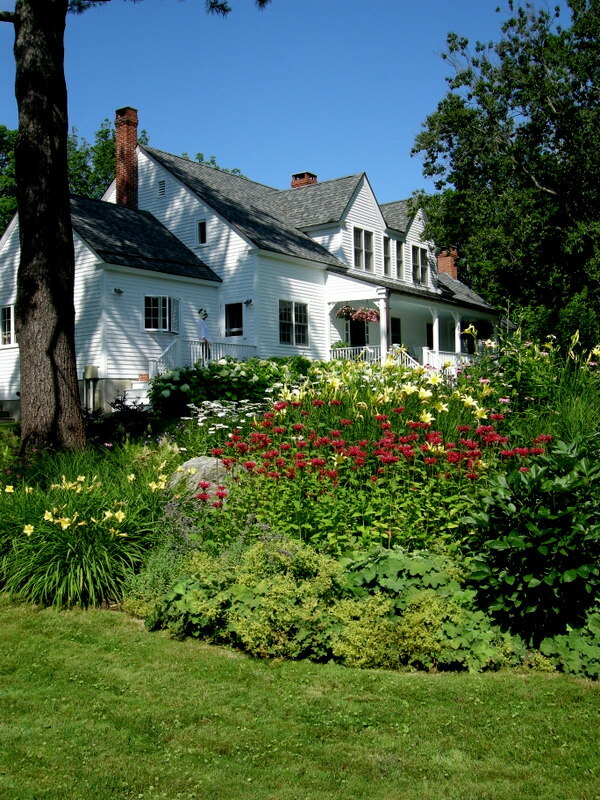 This was a very high quality tour, and I highly recommend that anyone in the area attend next year’s Camden House and Garden Tour on July 17, 2014. Photos of the final garden on the tour will be in the next post. This entry was posted on August 27, 2013 at 6:58 pm and is filed under Garden Tour, landscape design, Maine with tags Camden Garden Club, Camden Garden tour, Camden Harbor Maine, Camden House and Garden Tour, Camden Maine, Carolyn's Shade Gardens, maine gardens, Rockport Harbor Maine, Rockport Maine. You can follow any responses to this entry through the RSS 2.0 feed. You can leave a response, or trackback from your own site. Wow is all I can think to say. So different from our shade gardens but oh so beautiful anyhow. Lovely garden Carolyn… it would appear that you’ve been enjoying a wonderful summer! I loved your garden photos…I really love a lush county garden. 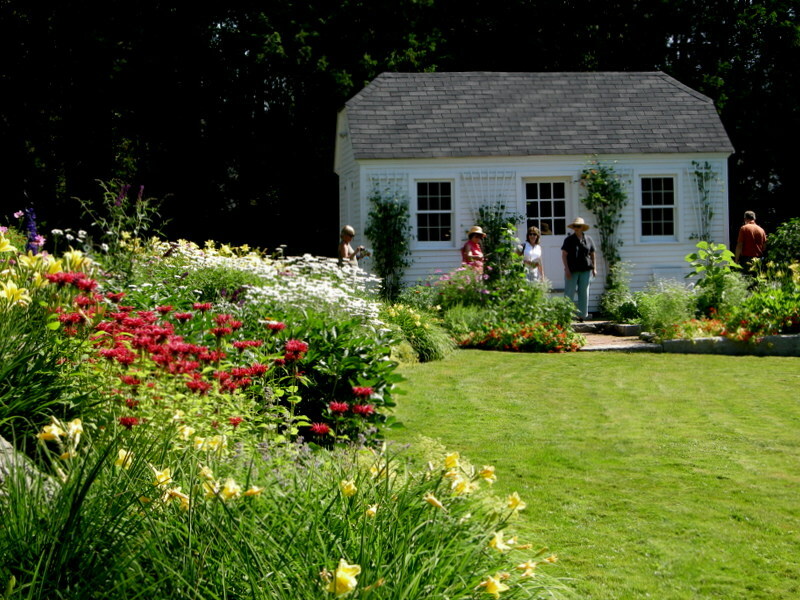 Lovely pictures – gardens in Maine have better color too. It must be the clear northern light! It is likely the cool nights are a big factor in the plants’ health for they don’t exhaust themselves by metabolizing all night long like our middle Atlantic plants do in the hot humid nights we have. And the Maine days are longer too even if the season is shorter. What a pittoresque shed. It looks more like a little house. That is a very pretty property. The tour must be really worth the trip, glad you enjoyed the time inland. What a beautiful cottage style garden! 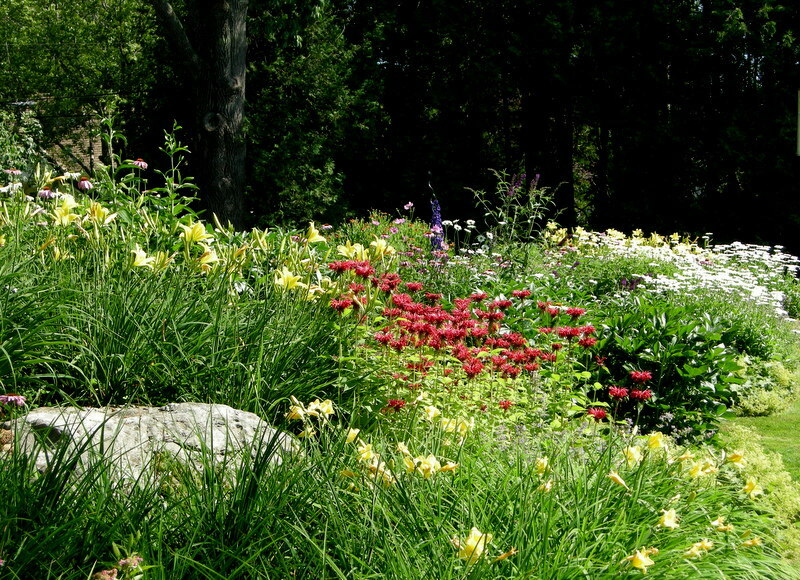 I admire these wonderful summer gardens filled with perennials! There was a time I tried to grow such a garden here, but I soon learned that most perennials died or went dormant during our summers. So I am filled with a little garden envy. 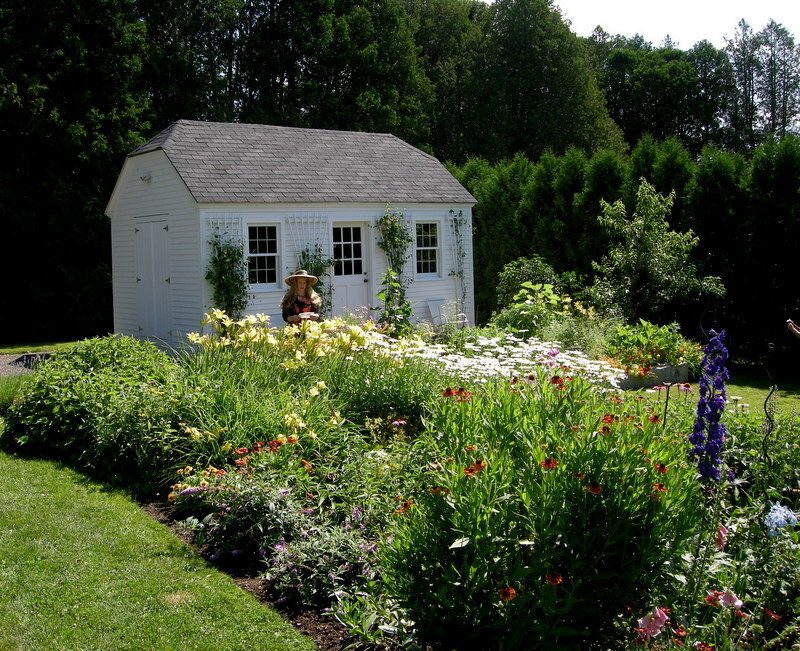 The garden shed with all those flowers in front is stunning. Thanks for taking us along. Do you think longer day length, compared to more southerly locations, would also play a role in how nice the gardens looked? Just grasping here in my fungus ridden, overgrown, weed-bound jungle of a garden. I visit Maine every summer as well and always marvel at the exceptional beauty of their gardens. I was thinking this summer that it was because of their short growing season. That the plants somehow know they have a short time to “show off.” The comments on this post, however, provide more logical explanations. I also love how they use boulders in their landscaping. Wish I could bring some of the boulders back to Saint Louis with me! I really like this house and the shed…they have a perfect garden to highlight it all. I am a new gardner and a new blogger myself, check out me blog. Any suggestions and feedback will be appreciative.